Often, when a craftsman pursues the road to independence through a business venture, they are inspired by a lifetime of collecting or being exposed directly to the craft. That wasn’t necessarily the case for Lincoln County’s Steve Randall, who has made an international name for himself crafting custom hand-forged knives from his workshop on the eastern end of the county. Things changed in 2009 when Randall started “KSR Blades” and built an extension onto his garage to house the vast amount of forging equipment needed to facilitate his burning passion to produce high-quality hand-forged knives. “I made my first sale on eBay and I was pretty excited,” Randall said. The ABS journeyman smith doesn’t sell his product on auction sites these days. 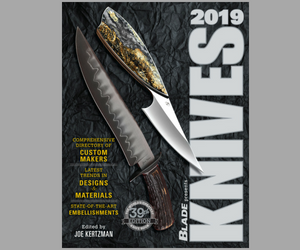 Having been featured in national magazines like “Knives Illustrated,” “BLADE® Magazine” and four of his creations featured in “KNIVES 2015,” Randall has a one-year backlog on special orders and also ships to Germany, Sweden, Australia and Canada.